Avocados growing on a tree. 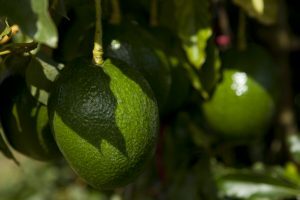 Avocado fruit. A University of Florida scientist has some new data that avocado growers might consider: The disease grows faster in the fall or winter than in the summer, so growers may want to look for Laurel Wilt more closely during the winter. Laurel wilt has been ravaging Florida’s avocados, which have a UF/IFAS-estimated $100 million-a-year economic impact on the state. UF/IFAS scientists say several species of ambrosia beetles transmit Laurel wilt to avocado trees.